The Liberty Was An Art-House and We Never Knew It! Many of us are too young to have stood on line for La Dolce Vita or talked over the finer points of Bergman’s latest in a beatnik coffee shop, but European sensibilities we surely cultivated for having supped at continental banquet tables of import genre pics --- reviled then, celebrated now. DVD has confirmed good impressions we formed over forty years ago. Who is Mario Bava but the more accessible and visually stimulating counterpart to a for-years dominant Fellini? You couldn’t have sold Sight and Sound on the bolder initiatives of Euro strongman pics, but we surely knew Hercules In The Haunted World was something special, even if such high-minded publications did not. Imports defiled formulas we had grown tired of. Those they created for themselves flaunted domestic protocol and whetted bloodlusts peculiarly satisfied by widescreen tableaux of men tied to, then torn asunder, by stallions whipped toward opposite directions. Muscles and monsters, then later arriving Italo westerns, announced they were capable of anything by crudely dubbed word, if not deed. We’d been put on notice by German-made frontier sagas with recognizable homegrown names (Lex Barker, Elke Sommer, etc. ), their genteel content given stature by Panavistas our westerns seemed to have lately abandoned. These played tandem with Hammer Films at the Liberty., By the time Spaghettis landed ashore, we matinee continentals were aesthetic equals for any Manhattan art-house habitué, our palettes evolved thanks to genre helpings we can now recognize as among the finest work Europeans were doing in those years. 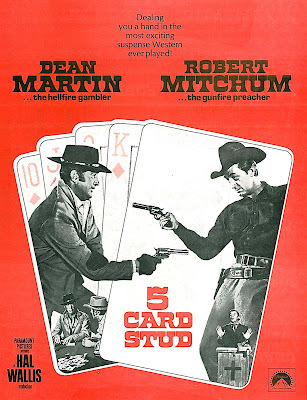 I much preferred slapping leather with taciturn (and youngish) Clint Eastwood to down-at-the-heels prairie wanderings of Charlton Heston as Will Penny or even old favorite Dean Martin in Five Card Stud. Both cast a pall for me in 1968. I wondered if they would again, so out came the DVD’s. Will Penny goes for the austere. Men get shot and writhe in pain. 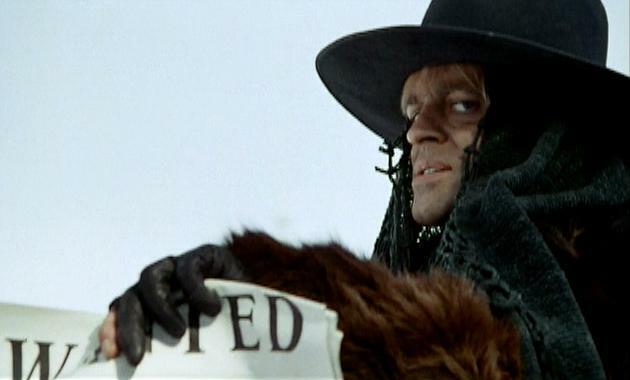 Heston’s self-conscious end-of-the-trail cowpoke makes no pretense to blowing down six guys for laughin’ at his mule, so right off we know there’s no fun to be had on this trip, but must villains, even psychotic ones, be so relentlessly sadistic and unpleasant as Donald Pleasance’s outlaw brood? We Yanks thought to checkmate Italians by producing more thoughtful westerns, but most of these came off as plain downers. Will Penny’s another where good folks are abused for what seems forever, only to chicken out in a pay-off hardly deserving of the name. 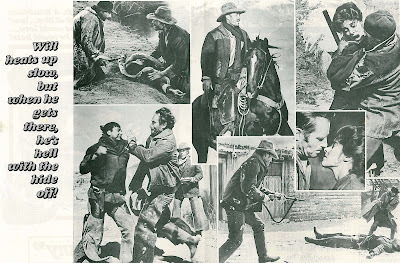 Too many earnest 60’s westerns substituted cruelty for violence, and miscreants got off with comparative slaps on the wrist, Will Penny being prime example. Fresh Italian milk had to curdle eventually. It didn’t take Spaghetti merchants long to begin biting hands that were feeding them. Imitators we expected. 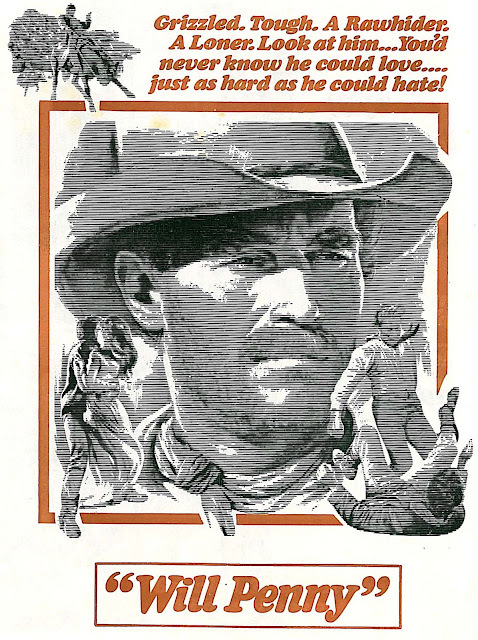 Eastwood was supplanted on the marquee by Tony Anthony, John Philip Law and lesser lights available to us by virtue of major studio’s willingness to distribute second –tier westerns where lips moved at odds with dialogue. The Big Gundown seemed good at the time, but I haven’t seen it since ’68. Another from that year surfaced on DVD after decades in obscurity. We never got The Great Silence on these shores, and maybe it’s as well for viewer trauma thus avoided. How could rivers of Spaghetti profits have made such nihilists out of Italian directors? 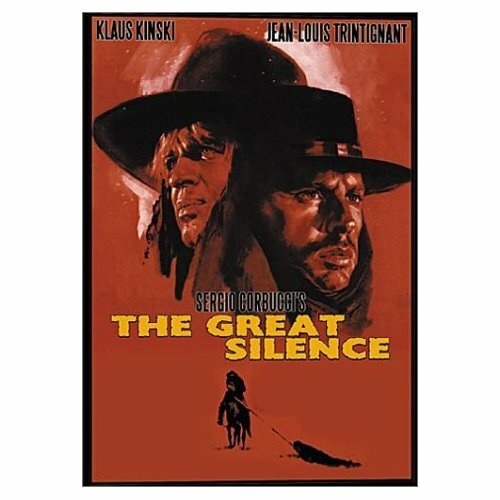 The Great Silence has a likeable hero shot dead at the finish, sympathetic townfolk he’d pledged to protect similarly executed by reptilian Klaus Kinski. I guess I admire the audacity of it, but how did sane investors imagine they’d get worldwide circulation with content like this? Films of a Great Silence sort, atmospheric to a fault, amounted to death wishes for a cycle still aborning. 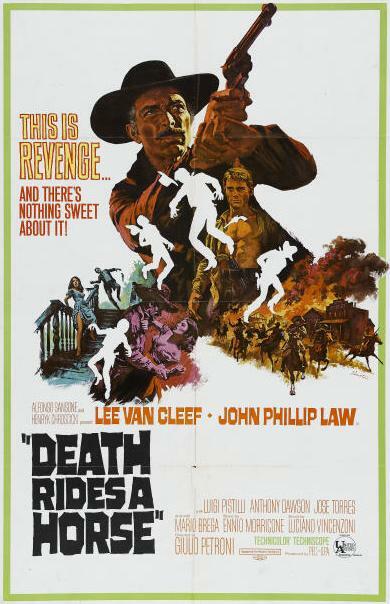 Other late sixties Euro packagings didn’t need bummer westerns to self-destruct. TV scavengers realized there were (seeming) hundreds of sword-and-sandal features available to fatten up color groups for economy syndication --- thus currency, and respect, for these died quickly. 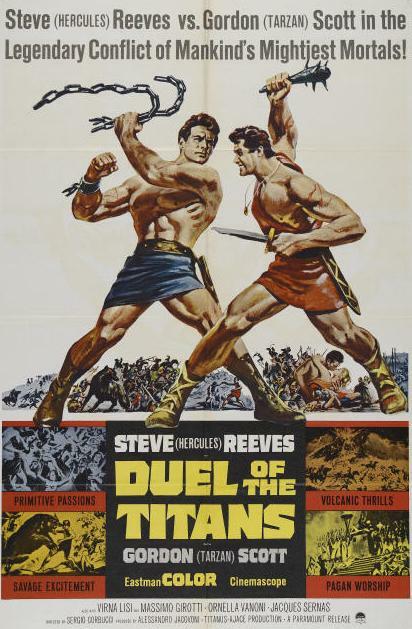 Those of us who had paid to watch Steve Reeves and Gordon Scott fight the Duel Of The Titans were now confronted with rubber-stamped Sunday afternoons watching Sons Of Hercules Against Maciste In The Valley Of The Medusa Head (take your pick from among kooky monikers these went by). Italian horror films were as dire. For every Black Sabbath, there’d be several like The Embalmer. I’d hear of Christopher Lee turning up in some of them, but if even AIP shrunk in the face of US distribution, you knew bets were off. By the seventies, we were back to buying American (save dreadful kung-fus, which made Spaghettis seem like models of sophistication). After so long a deprivation, I’m thrilled to see flocks of worthy Euros finally gaining passage to domestic shelves. So many are happy surprises --- I’ve never heard of shows I’m now enjoying. A Mario Bava DVD set is just out --- the deluxe career tome from Tim Lucas is imminent. Treasure hunts among these, plus the westerns, hold promise of many a pleasurable viewing hour. All we need now is someone to rescue and revive some of the better sword-and-sandals. Had hoped to get a weekend posting up, despite a first ever bout with kidney stones which came to call about 2:30 am Friday morning. If there’s worse pain in this life, I’ve not experienced it. Demerol’s a pleasant, if temporary, escape, though my weekend hopped up on said injections was anything but conducive to worthwhile (or even coherent) writing. I therefore plead the reader’s indulgence for whatever time is needed to overcome this insidious attack (I’m still waiting for the stone to pass) and do pledge restocking of Greenbriar shelves immediately upon recovery. 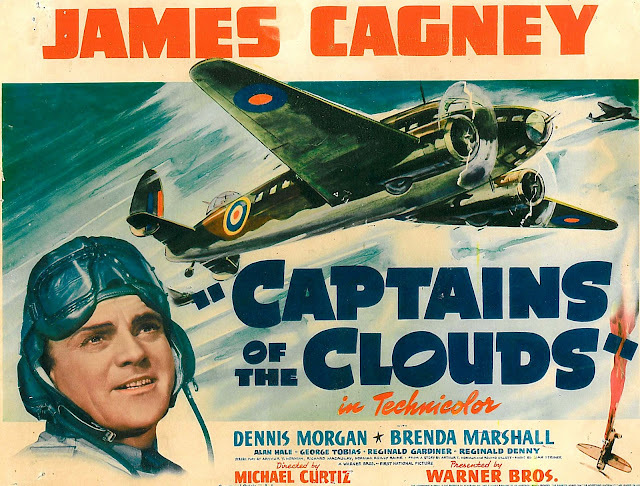 Captains Of The Clouds was a project held more or less in contempt by its star --- one more justification for Cagney's decision to bail out of Warners for greener independent pastures. I didn't like this story the last four times I did it, and I don't like it now, said he when exec producer Hal Wallis proposed Captains --- patriotic considerations may have persuaded him, and the fact it would be his first in Technicolor. This one is a must-see, or rather a must-have. It’s Cagney improv --- he cares not about the silly narrative and even less that we know it. 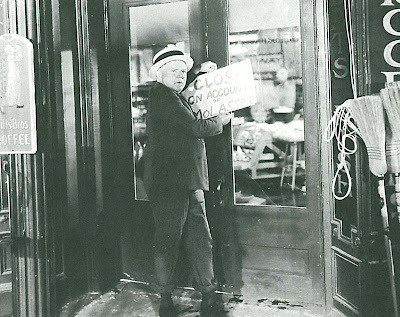 When bored with dialogue (often), he breaks into Yiddish --- in one scene, hapless Alan Hale's crossing the room and Cagney trips him (you can tell Hale didn't see it coming). Jim was pushing 42 when he made this, so there is at least tacit script recognition of his character's age. 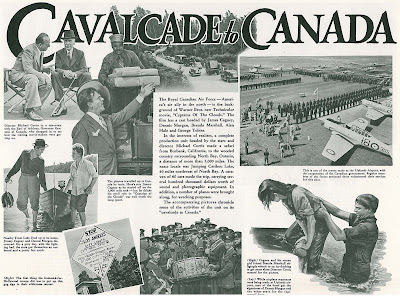 Still, he’s surrounded by an elderly lot of sidekicks --- Reginald Gardner, George Tobias, the aforementioned Alan Hale --- these four amount to a roving band of vaudevillians in the Canadian wild. One can imagine them whiling away location hours singing "the old songs" Cagney loved so dearly. And they vocalize for the picture too (with sheet music issued by WB for hopeful Hit Parade berths). Other endearing moments --- an extended nightclub sequence with snappily uniformed aviators surrounded by chorus girls and a rousing rendition of Captain's title song (itself heard from 1942 on whenever Bugs or Daffy took to the air). Were there really clubs like this during the war? If so, I don’t wonder enlistment was up. 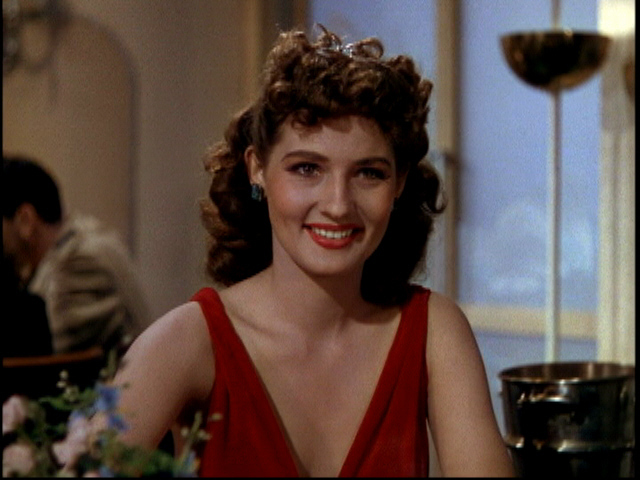 Then there is Brenda Marshall --- cold and passionless in The Sea Hawk --- but not so here. When Cagney gives her the honeymoon suite pay-off, she rips open the cash envelope like a tigress. There's little combat in Captains --- mostly aerial training stuff, but fascinating. Gorgeous color really sugars it up. Cagney's great years were essentially over when he pulled out of Burbank. Only White Heat lay ahead to remind us of glory days. 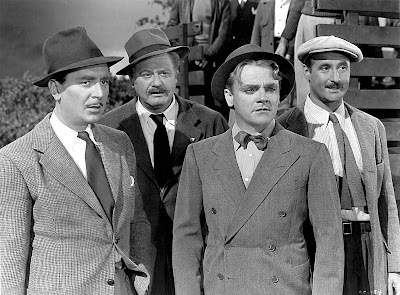 Captains Of The Clouds is a curtain call for the old "fun" Cagney of the thirties --- and as such, a definite keeper. There’s urgency, if not conviction, in wartime actioners produced at a time when outcome of the conflict itself remains in doubt. Captains Of The Clouds started as preparedness propaganda that lucked into completion shortly before Pearl Harbor and release soon after. 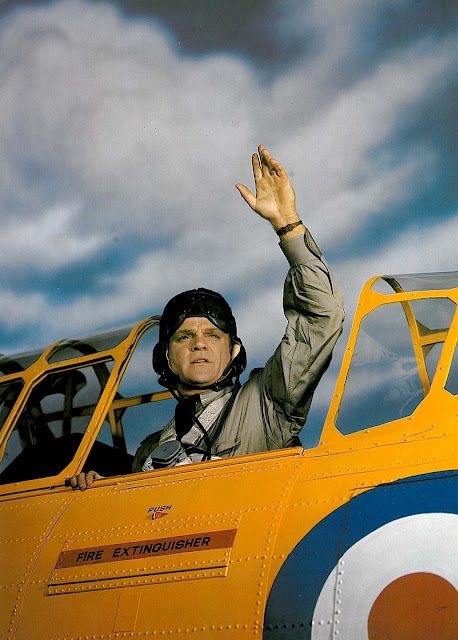 Destiny’s gift of perfect timing gave audiences a Cagney they’d had in reserve for just such an emergency. Misbehavior necessitated by a Depression and tolerated through numerous peacetime service hitches (wherein combat was limited to scraps with Pat O’Brien) supplied background and qualification for Warner’s aging warrior to take on the dirtiest opponents his country had yet faced. 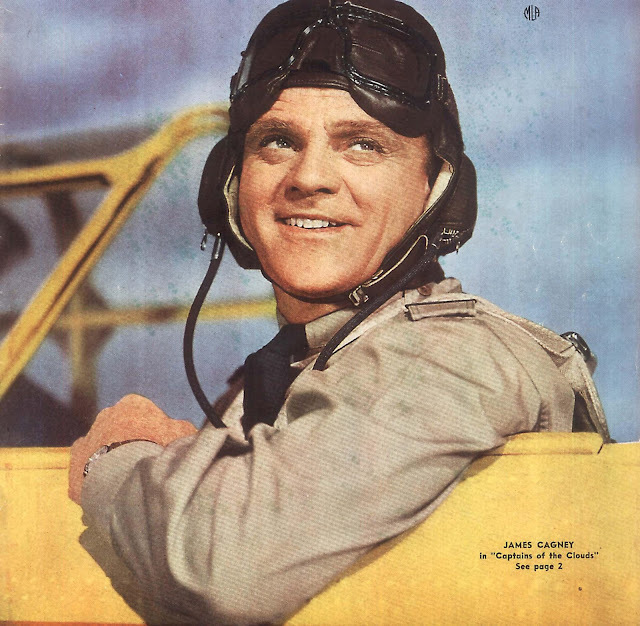 That Cagney would elect to play genteel hobos (Johnny Come Lately) while the shells of Air Force, Destination --- Tokyo and Action In The North Atlantic burst on a home lot he’d abandoned is one of the great movie losses of WWII. 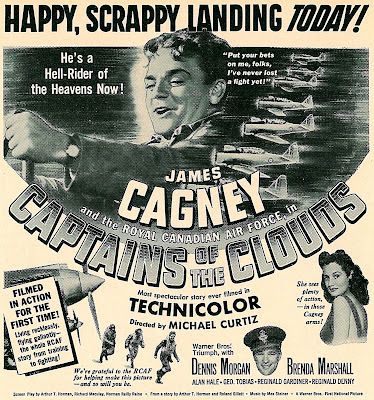 Cagney would have enhanced not only these, but any number of Axis-busters, to undoubted sellout numbers, if grosses on Captains Of The Clouds are any indication. Worldwide rentals ($3.4 million) for C.O.C. secured the record for all Cagneys thus far, to be surpassed only by his succeeding patriotic gesture, Yankee Doodle Dandy (with $6.5). The star would wrest himself from a public’s fond embrace by choosing to effect a studio (and image) change at precisely the moment we wanted (and needed) him most. There were belated reports for duty with 13 Rue Madeleine and Blood On the Sun --- both too little, too late. Had Cagney answered the call to arms C.O.C. and Yankee Doodle Dandy put forth, he and Warners could have won the propaganda war in a walk. 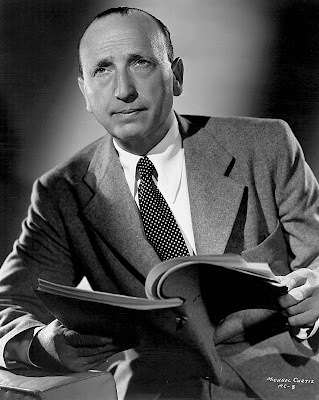 Michael Curtiz was an accomplished director. One of the best, if his list of credits is any indication. So why was this man who gave us Casablanca, Adventures Of Robin Hood, and Yankee Doodle Dandy treated like a cur dog by his employers? He was a masochist, a weirdo, said colleague Byron Haskin. He was a freak; he had to have abuse. Studio brass was nothing if not accommodating on that score. What the hell is the matter with you, and why do you insist on crossing me on everything that I ask you not to do?, asked Hal Wallis when Curtiz put lace cuffs on Errol Flynn in Captain Blood. What do I have to do to get you to do things my way? Jack Warner’s advice to production head Wallis was succinct. For Lord’s sake, get ahold of this Mike and set him on his pratt. No matter the success nor honors accorded his work … Curtiz was regarded little better than latter-day corporate beanbags in their own cubicled purgatories. Every night (during Captains Of The Clouds) he would have to call the studio back in Hollywood, and report to Warner and Wallis, recalled Haskin. If you ever saw a guy beaten to a pulp on the telephone, this guy was it … they’d bounce him around like a Ping-Pong ball for twenty minutes, absolutely tear him to pieces. Byron Haskin was doing second unit work on Captains Of The Clouds. He was in charge of much of what we saw in the air, Canadian location shots of bombers, convoys, etc. Basically, Haskin’s job was cleaning up after Curtiz. Office visits to the boss were similarly traumatizing for the director. Warner would just mow him down --- "You bum, you creep, you wouldn’t have a wife, you wouldn’t have a dollar, you wouldn’t have anything if it wasn’t for me." 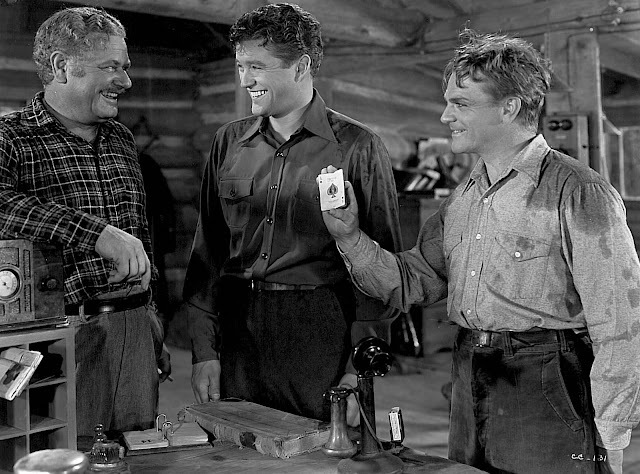 James Cagney’s indifference toward the project was somewhat tempered by Curtiz’s willingness to let the actor go his own way as to a script Jim described as the same old crap. Mike Curtiz was not only used to my adding to the dialogue or changing it, but actually encouraged it. Cagney’s creative input did not go unnoticed by Hal Wallis. All these little added bits that Cagney has been putting in are fine. He certainly knows how to add color to a character. Conciliatory words for a personality Warners couldn’t easily replace, particularly at a moment when Cagney’s services would most definitely be needed for the forthcoming Yankee Doodle Dandy. Technicolor is the major selling point now as then --- but can that trademark be accurately applied when dealing with digital? Real Technicolor would necessarily thrive on film, preferably dye-transfer and nitrate. One or two of these might exist on Captains Of The Clouds, more than that far less likely. There wasn't a major reissue, so to my knowledge it was never available for 35mm safety bookings in IB Tech. How far removed are we from the 1942 experience? Anecdotal evidence suggests Captain's color was astounding. Good as Warner’s new DVD looks, I wonder how it would compare with one of those nitrates. Once during collector days, and this was thirty-five years back, I threaded up a Coney Island trailer on a military surplus DeVry semi-portable 35mm projector. The mechanisms were linked by seeming miles of what resembled bicycle chains, the weight of this leviathan at least four-hundred pounds, but Betty Grable’s image on nitrate was lifelike beyond belief. Once exposed to an original canvas, could any of us be content with mere facsimiles afterward? Not likely --- so perhaps it’s as well the real thing is (largely) unavailable. With Technicolor, that’s been the case for many years. One can look at Captains Of The Clouds and swear this is the process at its summit, but what if someone at UCLA invited us out for a screening of their nitrate vault original? How different would such an encounter be? We’ve been separated from true Technicolor long enough to forget what it once looked like (and note the monster-sized camera used here to photograph Cagney). The industry discontinued regular use in 1975. Most surviving prints were eventually junked. Even rare 35mm screenings are often compromised by xenon lamp sources unequal to the task of cutting through the density of three-strip film stock. Projectors with proper carbon arc lamphouses are virtually non-existent. Fox’s DVD releases of Blood and Sand, The Gang’s All Here, The Black Swan, etc. are but pale shadows of formerly brilliant hues, thanks to the studio having land-filled Technicolor elements decades ago. Universal has excelled in reclaiming beautiful images from their 40's properties --- Arabian Nights, Shepherd Of The Hills, Can’t Help Singing --- these can at least simulate long-ago nitrate splendor. Warners has recently done as much for Captains Of The Clouds, Adventures Of Don Juan, and some of the Doris Day Technicolor features. To aspire toward dye-transfer prints of these projected as they were on original release is impractical. We’ll content ourselves with digital substitutes (hopefully) pleasing to the eye, and redirect imaginings to what Technicolor glories our forebears once knew. Eighty Years Since The General! Should The General have been a talkie? Perfection it is, but I can’t help imagining the sound of those trains in pursuit and cannons firing. Would that have brought us too close to the war? Could Keaton’s comedy have survived such levels of realism? Perhaps it’s best silent after all, though noiseless locomotives do seem to move slower. 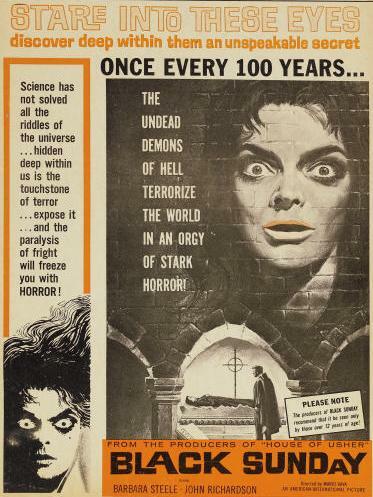 A year’s release later and United Artists might have grafted a music and effects score. That would be fascinating to hear. Modern accompanists can (and have) lent percussive assist beyond mere keyboards. The General’s public domain status places it within reach of anyone willing and able to reproduce the cacophony that accompanied its long-ago production. 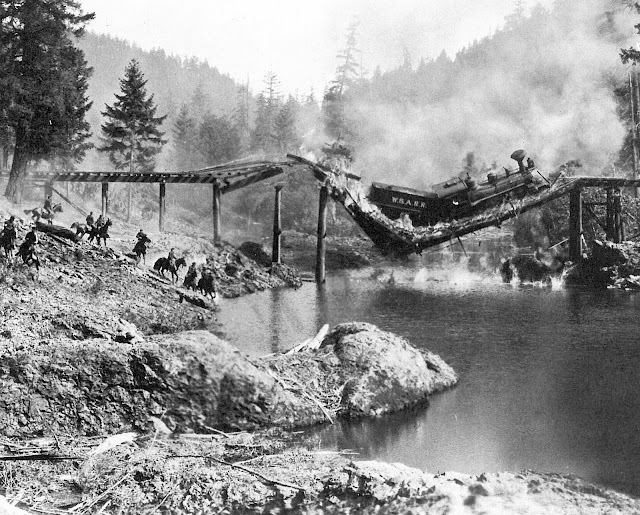 Kevin Brownlow’s documentary, A Hard Act To Follow, describes an eerie sound made by the train’s whistle after it collapsed with an Oregon bridge that Summer day in 1926. Witnesses to the event recalled it vividly decades later. 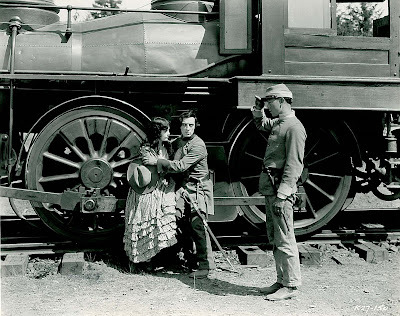 Combine that with explosions and a pitched battle employing hundreds of extras, then picture several thousand onlookers thoroughly unnerved watching Buster Keaton make his movie. Maybe we need the distance silence gives us where The General is concerned. Seeing and hearing those events of 7/23/26 would have been an entirely different sort of viewing experience, and maybe a not so agreeable one. There was last year an eighty-year commemoration at the Row River site where it all took place. The Register-Guard (Cottage Grove, Oregon’s newspaper) noted a submerged in water rusted rail as last remains from carnage staged so long ago. It would seem all of the viewers who were there that day have died, said the article. Locals that reminisced for Brownlow were elderly twenty years back when he interviewed them --- eyewitnesses few in number then have likely gone the way of civil war veterans still marching in parades when the film was initially released. Sobering data, especially now that The General glows brighter and more digitally alive than ever before. The French turned out a DVD last year, having restored The General yet again, this time to a fare-thee-well. Never has any Keaton silent feature looked so pristine as this. Cottage Grove locations glisten like footage shot yesterday. No wonder the place has become a Mecca for Buster-philes. 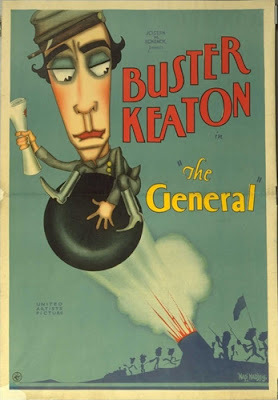 Their historical society has an annual Keaton Day (since 1999), and folks trek to hallowed ground the comedian trod as surely as tourists visit Gettysburg, only this Civil War was captured on film, and for all the world, it looks like the real thing. Buster’s masterpiece has become, with (further) passage of time, the historical document he’d always wanted it to be. You could peddle this as newsreel footage of the Blues and Grays, if only they had movie cameras in the 1860's. Keaton paid Oregon National Guardsmen to play soldier for The General. Today he could get re-enactors for free. Back then, Civil War buffs didn’t pass weekends suiting up and eating parched corn for authenticity. The reality of the thing was still fresh, at least in their parent’s memories if not theirs. What sane person in 1926 cared to relive a conflict not yet resolved in the minds of many? --- unless maybe they could do it for real and have another crack at an enemy they’d not yet forgiven. 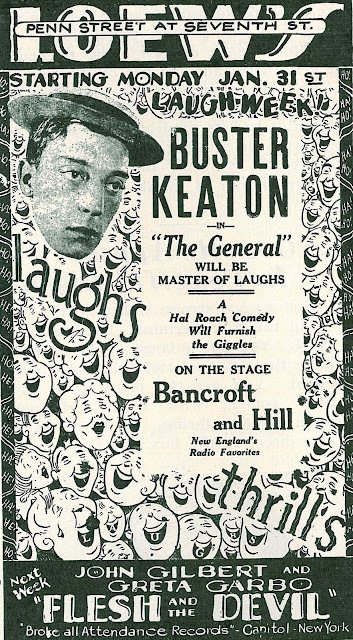 Keaton got criticized as it was for utilizing war (specifically death in combat) as inspiration for laughter. Critics expected comedy with a little adventure --- swinging over an occasional waterfall, outrunning boulders, stuff like that. Buster instead gave them adventure with a little comedy, and still cheekier on his part, based the whole of his story on historical incident. It was one thing for comedians to do period --- Harold Lloyd’s contemporaneous The Kid Brother, Raymond Griffith’s uniformed spoofery in Hands Up! --- but Keaton’s goals were loftier, and slapstick clowns full-scaling a then-more recent conflict was not a venture to be encouraged. Silent era viewers were practiced mind readers. Little was spelled out for them. Players conveyed thoughts as best they could without benefit of spoken word and it was up to us to get the message. 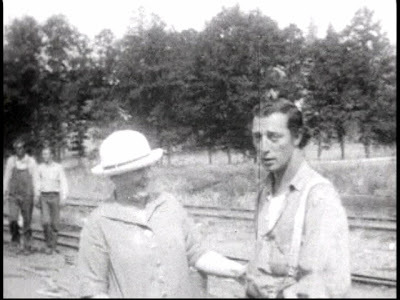 Buster Keaton flatters his audience by allowing them to sit and watch him ponder. He knows we’re with him in the crisis and there’s no need to oversell it. No comedian gave us so much credit for insight and intelligence. 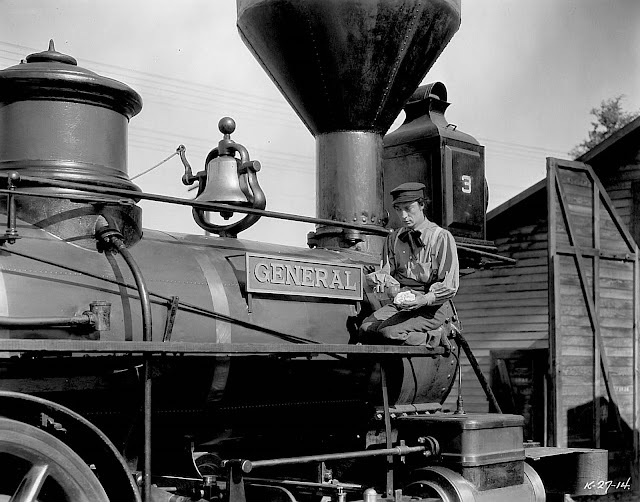 As raiders steal his train, Buster runs out with soapy hands, alerts the passengers, then pauses a beat to take further stock of the situation before going into action. 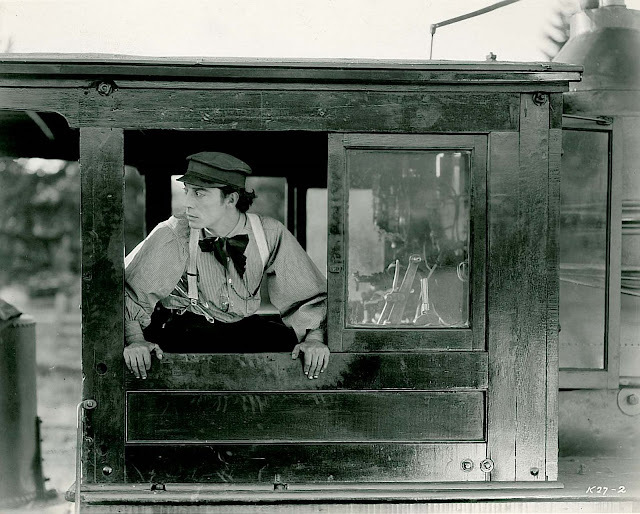 Is there anything so difficult as acting in motion, particularly at the pace Keaton maintains? All the great comics worked with props, but none so massive as those Buster confronts in The General. What assurance it must have taken to play opposite a moving train, staging one set-piece after another that might have been his last should the slightest thing go wrong. That business where Keaton sits on the drive rod as it begins to turn has been commented on by other writers, and they’re right in saying that had those wheels spun, even once, he’d have likely been killed. I paused on that moment not so much to reflect upon the risk of death as the likelihood of mutilation. These are train wheels, after all. Think of what they could do with a human body caught between them. Keaton might actually get more laughs were it not for his near supernatural nerve. Viewers in awe of death-defying feats are understandably moved to gasps rather than mirth. Silent Buster’s exertions seem otherworldly --- as if he had harnessed the CGI life-force generations before it was otherwise discovered. Would we need computer fakery to make Spiderman movies today if Keaton were playing that super-hero? 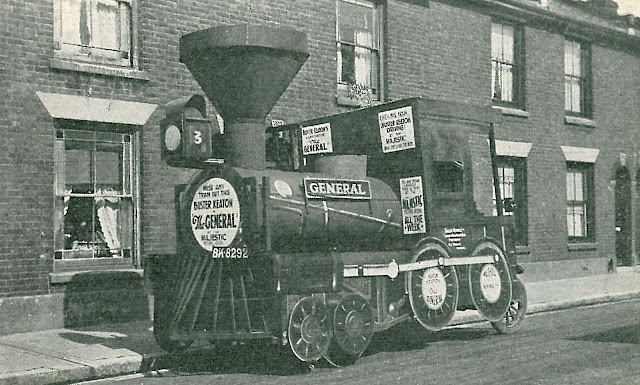 There were previews of The General during November and December of 1926. Existing stills indicate cuts were made, but when? Those audiences in Los Angeles, Glendale, and San Jose saw footage we never would, but what of the opening in Japan on December 31, 1926? Has anyone translated reviews to see if that version was different from what we have today? There was a near two-month gap before general release in America. I wonder if stateside viewers saw the same General as the Japanese. Controversy has been ongoing as to its commercial fate. Who can say it lost money short of inspecting a producer’s settlement statement (and I suspect this exists in archive holdings, based on considerable United Artists documents known to have survived)? Negative cost is said to have reached $500,000 … $700,000 … as high as a million. The figure I have is $415,000, and that did come from UA records, as does the domestic rentals number of $486,000. I’d like to know of General screenings after 1927 --- I mean prior to late forties inclusion among circulating library selections from The Museum Of Modern Art. 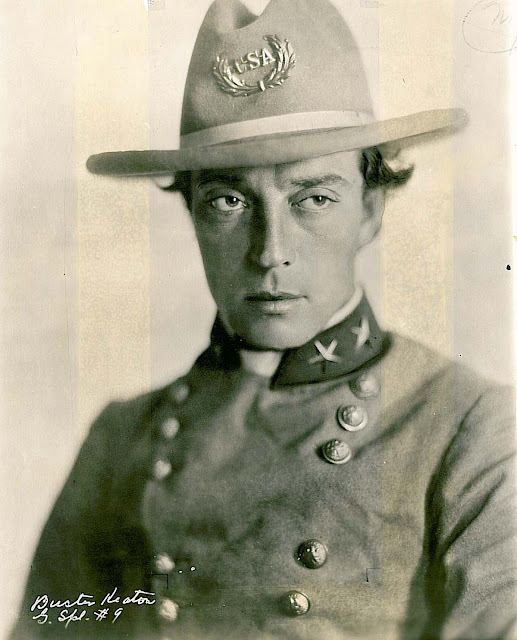 Buster Keaton was known to have caught The General during the early fifties at John Hampton’s Silent Movie Theatre in Hollywood. Veteran stars were habitues at revival showings of their long-ago work, and most paid admissions like everyone else. Indeed, many went unrecognized. 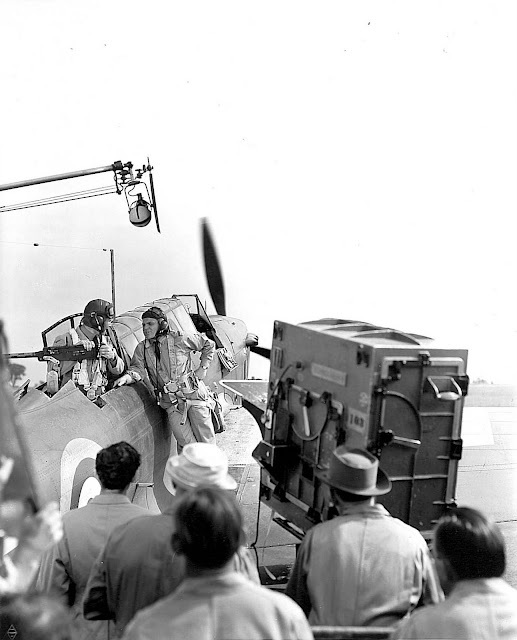 The General’s leading lady, Marion Mack, said in an interview that even after she announced herself as co-star of the film, they still made her buy a ticket. Critical rediscovery was still in the offing, though James Agee did sing Keaton’s praises in Comedy’s Greatest Era, his LIFE magazine tribute published in December 1949. 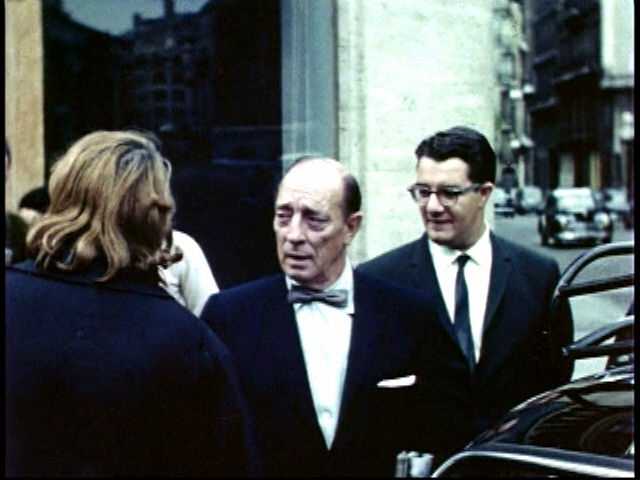 The real comeback would wait until Raymond Rohauer took the General show on the road in the early sixties with a still game Buster Keaton (shown together below). The story goes that Rohauer came into possession of The General’s camera negative and made new prints. A European tour in the wake of Keaton’s published memoirs was triumphant. U.S. engagements followed, though surely vexing to Rohauer was public domain status The General and two other Keaton UA features attained since a failure to renew copyrights in the mid-fifties. It was thanks to this happy circumstance that most of us were able to see, if not own, The General. 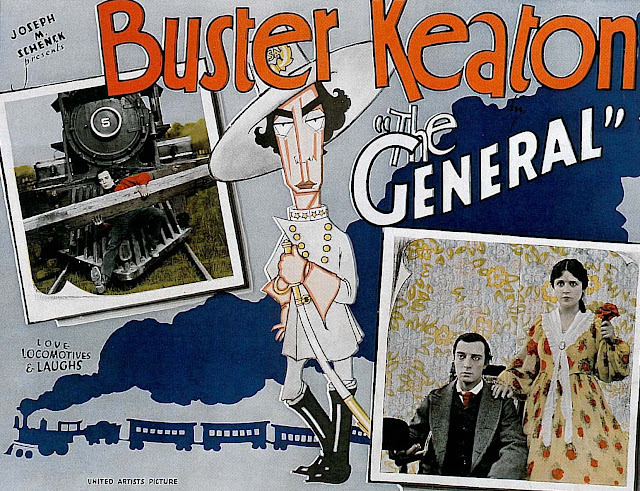 Richard Anobile’s frame enlargement book of The General was published with Rohauer’s blessing, plus his introduction and reminiscences from Marion Mack (there was also suspicious notice of The General’s copyright having been renewed back in 1954 by The Buster Keaton Film Corp.). Anobile’s book is worth having just for these openers. That was 1975, the same year Walter Kerr presented his seminal appreciation, The Silent Clowns, which included extensive coverage of The General. Kerr’s high-profile media standing guaranteed sales and critical attention. 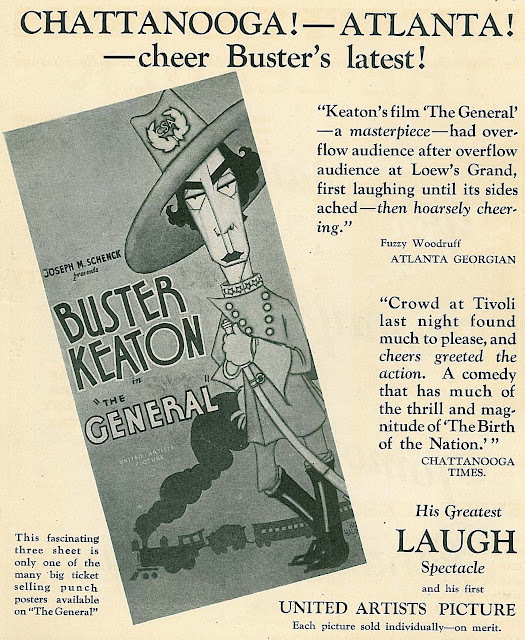 For some time too, Blackhawk Films had been selling The General on 8 and 16mm (their catalog listing shown here) and print quality was of a high standard. 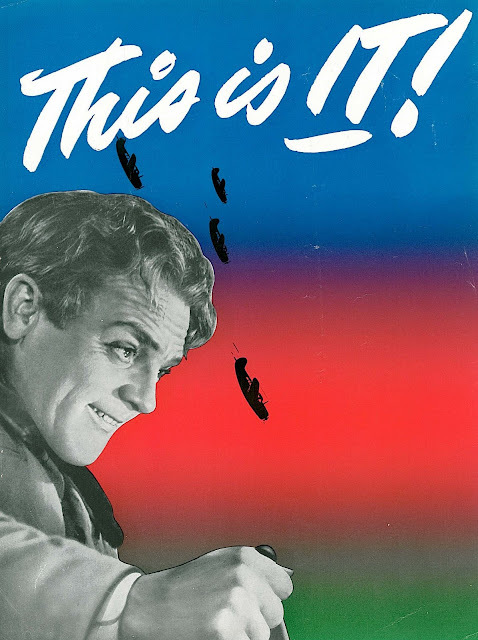 Rohauer’s resistance to said competition resulted in weirdly subtitled prints (generated in partnership with Jay Ward), which were exhibited at programs he sanctioned. Marion Mack, having been found after an exhaustive Rohauer search, was along for the ride, theirs probably the first money-generating tour back to Cottage Grove locations. Paul Killiam distributed The General along with 35 other silent features in a Festival Of Film Classics TV package made available in March 1970. These played mostly on Public Television and were by far the most respectful presentations The General received during that decade. Orson Welles’ on-camera introduction reflected critical shifts in Keaton’s favor. He was, as we’re now beginning to realize, the greatest of all the clowns in the history of the cinema. I’d venture Welles appreciated not only Keaton’s artistry, but his lifelong modesty, something unspoken rival Chaplin never exhibited. Did Orson agree with others that maybe it was time to take Charlie down a peg or two? That’s surely been an ongoing trend since. Everyone lauds Keaton’s modernity versus Chaplin’s Victorian excesses, but my own University runs of both have seen audiences tip in Chaplin’s favor. Say what you like about dated sentiment, but I’ve watched students cry at the end of City Lights and The Great Dictator. The fact is both Keaton and Chaplin have so much to offer --- it’s plain foolish to pit them against one another.